With mushrooms, sage, fennel, and a good helping of marjoram, this stuffing is the aroma of Thanksgiving. With mushrooms, sage, fennel, and a good helping of marjoram, this stuffing is the aroma of Thanksgiving. We make this stuffing every year at the family Thanksgiving dinner. It's so good that every year we repeat it and look forward to it. I even make it at other times of the year when craving the tastes of Thanksgiving flavors. Wherever we are in the world, my family makes every effort to be together on Thanksgiving. A few of the people in my family eat plant based and gluten free diets. This stuffing makes it possible for everyone to enjoy a great meal without issue. It's filling too even on it's own! 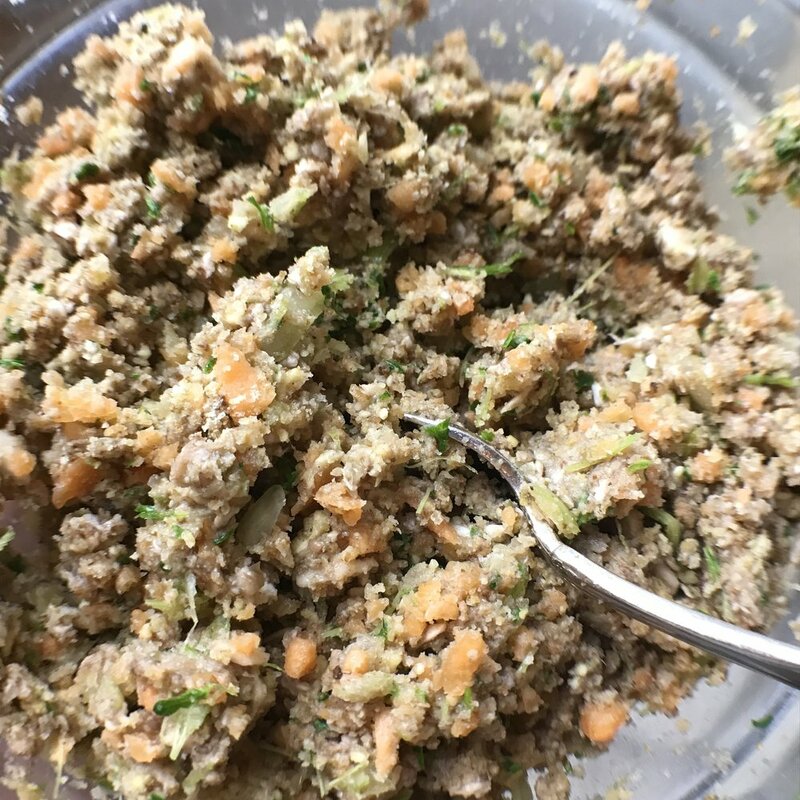 This stuffing or dressing is an easy recipe. The best thing about it is that it can be enjoyed with turkey or a plant based meal. It tastes great with cranberry sauce (recipes below)! Optional to buy in advance, get on Treatmo iOS App: Daddy's Gourmet Marjoram Lemon, Terre Botanicals Fennel Culinary Oil, Kamen Organic Olive Oil. Wash carrots, celery, and mushrooms an hour ahead. Wrap in a towel and let dry. Puree carrots, mushrooms, celery, parsley, olive oil, fennel oil and spices in a blender. We used a Cuisinart. Puree the hazelnuts until fine. Combine the hazelnuts with your vegetable mixture into one bowl and mix well. Stuff into your cleaned turkey when ready to cook. Blend all ingredients until pureed, add a cup of water, and puree over medium low heat for 15 minutes. Serves 5. Shop Daddy's Gourmet Marjoram Lemon on Treatmo iOS App. It's essential for this recipe and provides just the right amount of slat, as it is mixed with red Hawaiian sea salt. Kämen Organic Olive Oil and Purinton Maple Syrup and Maple Sugar are also available on Treatmo. Get the app on iTunes to shop or gift!